Precision Grading & Utilities, Inc. The University Wisconsin – Stevens Point, located in the central portion of the state, opened its doors in 1894 and currently enrolls approximately 8700 students. Over the years, the University of Wisconsin – Stevens Point has graduated over 70,000 students in a variety of disciplines. The university used AECOM to redesign parking lots K and R on campus. 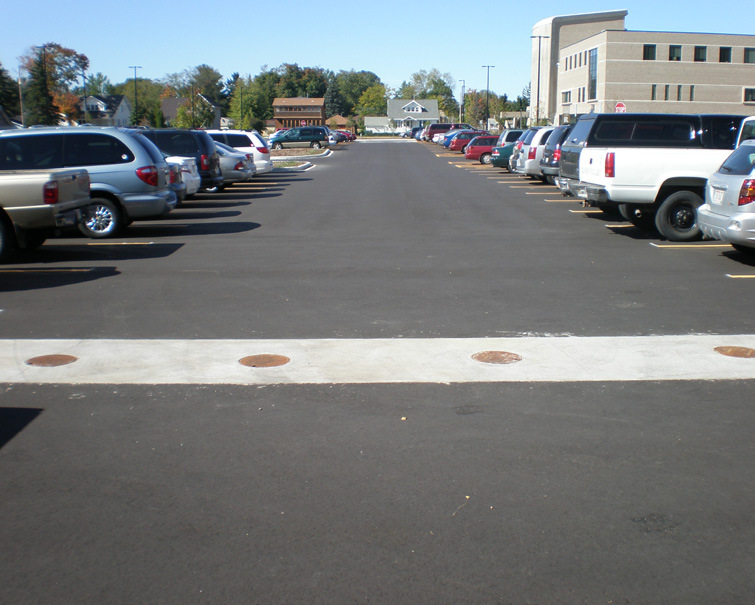 The university wanted to have a “green” solution to the drainage design; therefore, AECOM used seven BioFilters in the design for parking lot R but they still did not have enough infiltration due to the number of parking spaces required combined with the limited pervious area. They did not yet meet the DNR stormwater requirements. AECOM contacted Contech Engineered Solutions to help them with the drainage design for Lot R and to find a “green” solution to their situation. The economical solution provided was an underground corrugated metal pipe detention system that could store more than 8,622 cubic feet, preventing flooding of the parking lot. It would then slowly discharge the stormwater into the surrounding soil over time. For the underground detention system, seven runs of 91.5-ft. long 36-in. diameter fully perforated aluminized metal pipe was used. The corrugated metal pipe detention system met the University’s and AECOM’s design criteria for storage, infiltration, strength, durability and cost. Amount: 6,405 lf. of 36-in. dia.